One of largest resort core youth marketing campaigns is complete and the Mountain High “Experiment” has concluded. Manhattan Beach, CA – January 8, 2013 – Marketing Farmer announces a complete wrap up of the Los Angeles marketing campaign and the conclusion of the Mountain High “Experiment.” In December of 2010, Marketing Farmer’s, Brad Farmer was brought onboard to develop Mountain High into a legitimate force in the core snowboard market and thus a two year experiment began and one of the most powerful resort youth marketing campaigns ever was set in motion. “We accomplished what I feel are some amazing achievements in just two years and helped take Mountain High from a brand that was typically failing to reach the core market to one that was attracting top professional riders, building a world-class level parks, was considered to be releasing some of the best marketing content and building the potential to become a destination for core snowboarding,” says Farmer. From the beginning, Farmer needed a concept that would have a powerful impact in order to bring Mountain High into prominence in the very fickle core snowboard market. Thus the Los Angeles marketing campaign was born. “I was really inspired by how close Mountain High is to Los Angeles and how relevant the urban culture is to this particular mountain resort that sits in the backyard of Los Angeles. When I started conceptualizing this new marketing plan and deciding how to connect the city to the mountain, this whole movement unfolded as if it was meant to be,” says Farmer. From right to left is Ryan Paul, Nick Visconti, Cory Cronk, Matt Devino, Trever Haas, Brad Farmer, Spencer Link and Kyle Lopiccolo. The Los Angeles campaign included a new professional snowboard team, a massive effort to bring in top professional riders, core media and best brands, the new LA terrain park features, LA features marketing push, Drive In online video series, Los Angles The Movie, Los Angeles The Movie release promotions, Los Angeles movie premiere, and finally, the Los Angels marketing push. “It’s a ton of Los Angeles I know, but the two year campaign was very successful and had a significantly positive impact on Mountain High,” says Farmer. “I’m incredibly proud of what we accomplished at Mountain High and I have to give special thanks to Matt Devino and thank Karl Kapuscinski, John McColly, Kim Hermon, Ben Smith, Justin Montoya and Todd Proffit, along with all of the guys on the team. Without their help and support, this would not have been possible,” says Farmer. Unfortunately, all good things must come to an end and Marketing Farmer’s youth marketing work with Mountain High has now concluded. “It was an amazing experience and I really hope that the Mountain High crew will take the momentum that we have built and roll on but I also need everyone to know that I’m no longer working with them and thus none of their current marketing work is originating from myself or Marketing Farmer,” concluded Farmer. Marketing Farmer is still involved with certain project work for Mountain High and sister resort, Stevens Pass including the establishment of new resort sponsorships but is no longer leading the youth marketing effort. 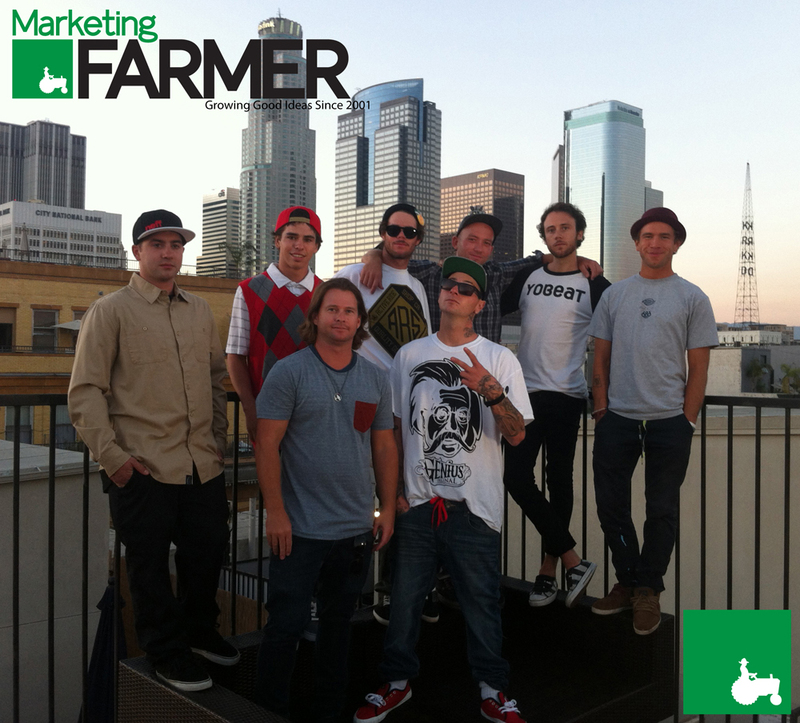 About Marketing Farmer: Marketing Farmer was founded in 2008 by Brad Farmer with a mission to help brands and resorts build effect youth marketing strategies that reach their target markets in a legitimate and effective way. Today Marketing Farmer is branching out in a variety of directions offering complete action sports marketing services and activating an athlete management division. Marketing Farmer has a history of solid clients including Big Bear Mountain Resorts (Bear Mountain and Snow Summit) ESPN Actions Sports, FUELTV, Arbor Snowboards, Arbor Skateboards, Arbor Apparel, Mountain High Resort, Stevens Pass Resort and Flux Bindings. For more information on Marketing Farmer visit www.marketingfarmer.com.